Childhood obesity. Video games. Television. Air quality. Bugs. Weather. There are lots of circumstances that conspire against children playing outdoors these days, so much so that getting kids outside is one of the biggest challenges of parenting in the New South. 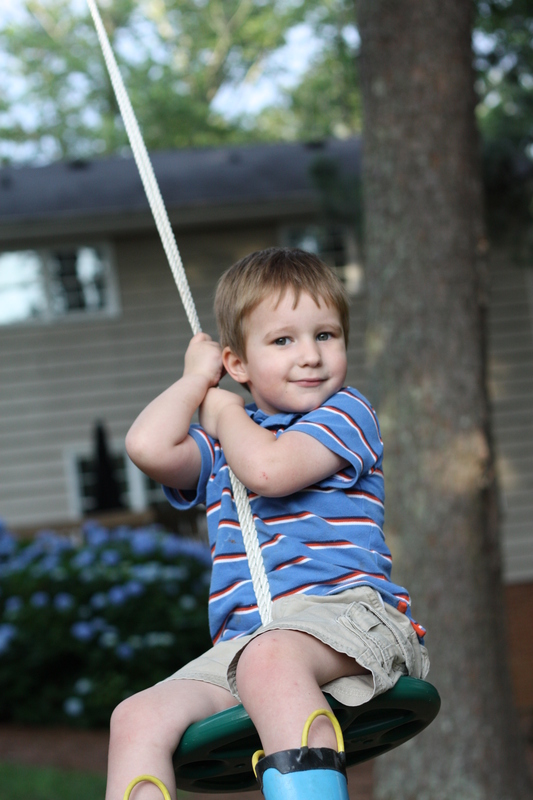 Even the little guy can hold his own on the new rope swing. Long gone are the days when barefoot children hit the screen door after breakfast and wouldn’t return until supper time. Now, you have to pry them off the sofa with a giant spatula, forcibly remove them from in front of a digital screen and lock the doors after them if you want them to spend any time soaking in Vitamin D or getting fresh air. This spring I unwittingly hit upon a new weapon that has kept my kids outside more than in any previous year: a disc swing. For eight years we’ve had a small, red disc swing hanging in a dogwood tree. Yes, I know, that’s the not ideal dendrological solution for a rope swing, but the swing is unobtrusive and bears the weight of smaller children just fine. Not every ride is death-defying, though Harris may have you believe this. But now that our oldest is around 100 pounds and there are three of them fighting over one swing, Carla and I decided it was time to either cut the “red swing” down or put up another one. In reviewing some “before and after” photos of our yard, Carla stumbled across a photo of the back when we first moved in. There, hanging from the big tree in the center of the backyard was a fraying nylon rope, knotted in several places. It brought back memories of Barron, then 2, falling from the rope while my dad pushed him just a week after we moved in. That was the end of that. The rope came down. But now that our kids are older, the idea once again had merit. So on a recent Saturday afternoon trip to the local home improvement store, we found a rope disc swing kit, bought 50 feet of nylon rope and created the solution to all of our couch potato problems. The new rope swing hangs about 20 feet beneath a sturdy branch in a large tree I can’t identify in our backyard. The extra length of rope and relatively obstacle free swinging zone – not including the tree itself – makes the new swing a much better ride than the old one. Perhaps more entertaining than the actual swing itself was watching me try to hang it. At first I attempted the lasso technique. I’m a lousy cowboy, so I reverted to tying the rope to the tailfin of a modified Nerf mini-football. The rope was too heavy and my technique was so poor I finally resorted to tying a string to the tailfin and connecting that to the rope. It worked like a charm, but it took the better part of an hour for me to figure it out. Naturally, the boys now fight over the new swing, but it does give them an incentive to get outside. 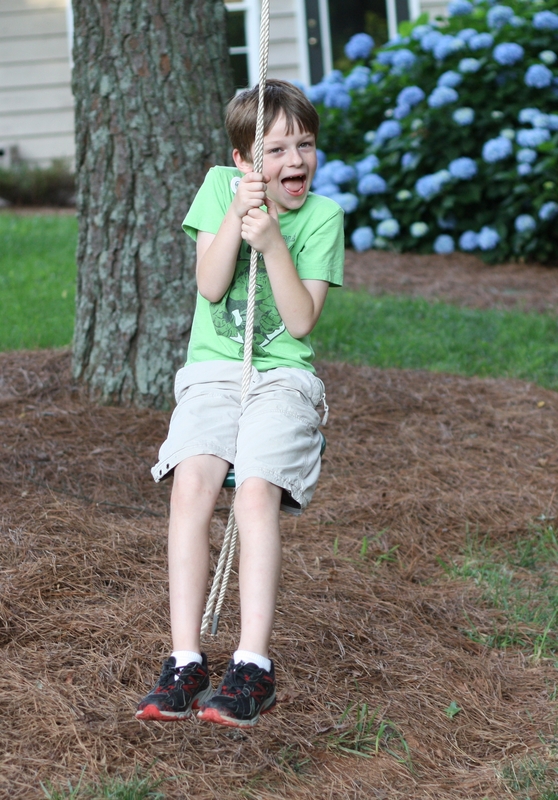 They race to see who can be first, and any time the swing is unoccupied, one of our boys is likely to dart outside – with our without shoes – and get some undisturbed swing time in. We’ve had several backyard occasions this spring in which the disc swing was a huge hit. Harris’ Lego-themed seventh birthday featured an inflatable, a piñata, a sandbox and a Lego table, but it was the rope swing that was the main attraction. Likewise at our recent end-of-the scouting year den meeting. This is “Batman Barron’s” preferred way to fly. What makes this throw-back recreational device such a popular addition to our backyard? First, it’s simple. It doesn’t require skill or strength or coordination. Kids don’t have to figure out how to use it. They get on, they push off (or they call for Daddy to come push them, more likely) and they go. It requires no batteries, no electricity. Second, it provides a safe thrill. Sure, if they let go they can get hurt. Barron learned that lesson at age two. But not a lot else in the backyard can give you that giggle-inducing tickle in your stomach. Third, it helps you attain new heights, literally. Kids love pushing boundaries and competing. Who can jump the farthest, run the fastest, hold their breath the longest? The rope swing gives them one more limit they can push: gravity. Who can swing the highest? It’s been a great spring weather-wise in Atlanta. Carla and I have enjoyed the view of our backyard from our Adirondack chairs as the kids have laughed and swung and run and played for hours. When the kids are in the yard, it just feels like the way childhood is supposed to be. What’s your secret to getting your kids to play outside? 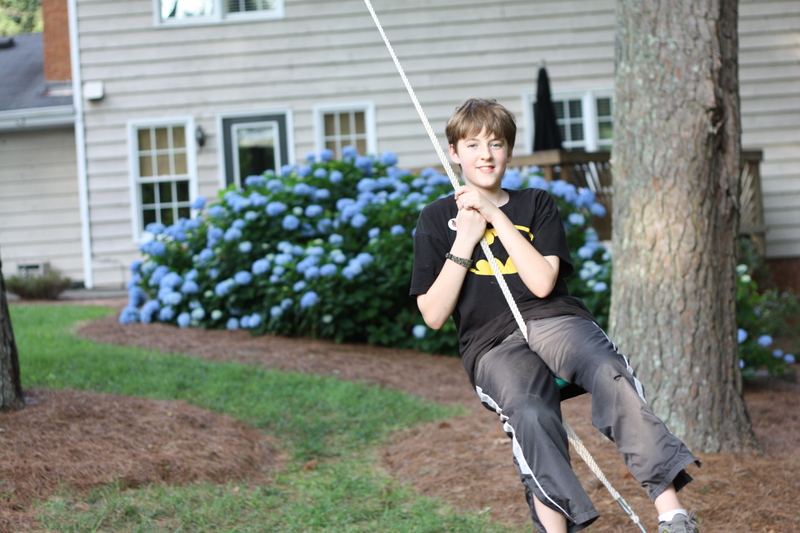 Perhaps you had a beloved rope swing as a child? Leave us your thoughts in a comment below. This entry was posted in Uncategorized and tagged air quality, backyard, bugs, childhood obesity, contemporary South, Cub Scouts, disc swing, fresh air, fun, kids exercise, Lance Elliott Wallace, Lance Wallace, New South, New South Essays, NewSouth, outdoor fun, parenting, playing outside, recreation, rope swing, South, Southern, Southern Culture, Southern Living, Southerners, swing, television, the South, video games, Vitamin D, weather. Bookmark the permalink. When the ennui of long summer days made us lazy, my mother would force us outdoors, locking the screendoor behind us. But there were also those days we took to our bicylces on the unpaved roads around the tiny town of Tate, GA, taking sanwiches and being gone for long hours of the day. Our parents did not worry about us at all as long as we showed up at suppertime. Then, after dark in the summers, there were very exciting games of Capture the Flag ranging all over our small neighborhood. It was a wonderful chldhood. ON hot summer days, when the ennui of the day made us lazy, my mom would force us outdoors, locking the screendoor behind us. But there were also the days we took off on our bikes, exploring the many unpaved roads outside our small town of Tate, Ga. We might take sanwiches with us and be gone all day. It was fine as long as we were back by suppertime. Then, after dark, there was the thrill of playing Capture the Flag with other neighborhood kids — ranging all over our small neighborhood. It is sad that kids today don’t have that kind of unfettered freedom. Actually had a tire swing at my parent’s place in Terrell, Tx. My dad strung it over a huge oak that overhung a dry creek bed. Must’ve been a 12 drop from top to bottom, but at 10, it felt like twice that and more! Took a lot of courage the first time. Nothing like hanging on for dear life to strengthen your arm muscles! Love it! This reminds me of the many hours of outside play our children enjoyed in Aiken. Maybe I should buy a swing for the little ones that may be in our future. Freedom on bikes is a good outside-play motivator. Teach them rules, and let them go. Swings, blankets and books for outside reading, sidewalk chalk for art, and our newest addition is a zip-line. When Matt and I spend time outdoors, the girls are more likely to as well. So, modeling is always great. Family walks around the neighborhood, and last but not least the old force: “No one comes back inside until supper’s ready!” These all work for us.